DRPU Rich Snippet Generator software creates Microdata Code to add structured data on your website. Rich Snippet code maker software generates Google compatible rich snippets for your website to increase website ranking in search engine. Software facilitates to make your services or products more accessible in search engine result by putting rich snippet code about your Business, Products, Events, Movie, Review, Book etc. Rich Snippet code maker software creates search engine friendly rich snippets code to enhance website visibility in various search engine result. 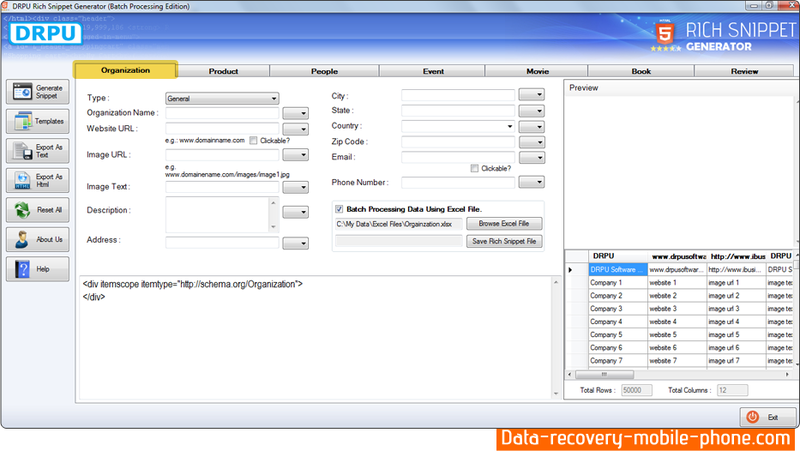 Rich snippet maker tool generates snippets code and facilitates to save it in different txt file. Rich Snippet code maker software designs Microdata code which helps search engine to understand what information is contained in webpage. Rich snippet maker software facilitates to export code in html or text file format as per your requirements. Rich Snippet maker software designs Google compatible Microdata code which helps search engine to provide more relevant information. DRPU Rich snippet code maker software provides option to browse excel file for creating rich snippets. Rich Snippet software designs code which helps to increase website ranking for all popular search engines. Rich snippet software is compatible on all major Windows operating systems.